Today for the tour I'm visiting the fabulous author Jessie Harrell (YA). There is an excerpt over at Jessie's you won't want to miss. Remember, you can get extra points in the giveaway by stopping by the blogs on the tour. I hope you'll stop by both locations to say hi and to get extra entries to win this fabulous prize. 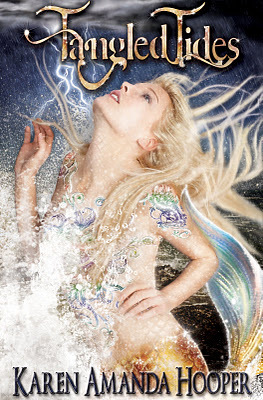 This week I’m giving away a signed paperback of TANGLED TIDES by Karen Amanda Hooper. It is about a girl who finds herself tangled up in the underwater world of mysterious merfolk and secretive selkies. It is one of my favorite books of the year so far, trust me you’ll love it! The contest will be open until June 3rd, the winner to be announced on the 4th. OOOHHH! Snorkling. I was afraid the first time I tried it but it turned out to be wonderful. Thanks for the pic. Almost feel like I'm there with you. Now if only I could actually be there lol!! Hoping you're having loads of fun! Snorkling! Fantastic. And to get to see a tortoise so close up, ALSO fantastic. I'm so glad you're having such a great time in Hawaii! The water was maurking but it was still awesome! I'm not a swimmer so this may sound dumb.... but how deep do you go when you snorkle? 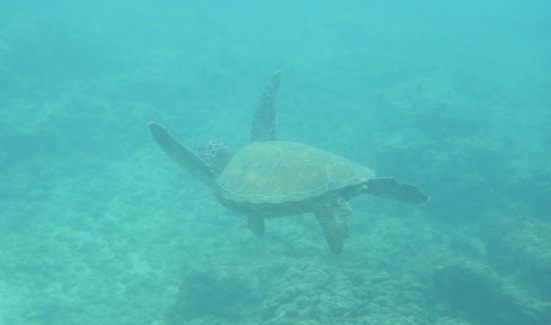 Still lovely picture though, did you get close to the turtle? Most snorkeling is done on the surface looking at stuff just below you. But you can dive down too! I got within touching distance~but we're not allowed to touch them. Cool turtle! I think I would love to be able to snorkle in an ocean, and not just a swimming pool LOL! It's amazing! I highly recommend it.